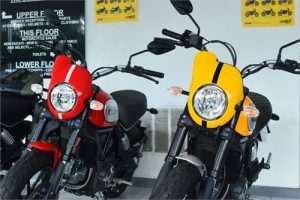 UK Bodywork Specialist Pyramid Plastics has released its brand new retro-style Nose Fairing for the Ducati Scrambler. Designed to fit the Scrambler’s headlight and clock arrangement perfectly, this unique Nose Fairing offers the rider added protection while enhancing the retro styling of the bike, making it stand out from the crowd. Available in a number of colour matches for the Icon, Classic, Café Racer, Full Throttle and Sixty2, Pyramid’s Nose Fairing is also available in Camo, Brushed Aluminium and Sticker Bomb finishes. Very easy to install and starting from £115 RRP.